I thought I'd do something a little big different today, in honour of a little fashion show that's taking place in my hometown today (Chanel in Linlithgow - who would believe it?!). I'm very much a highstreet girl when it comes to clothes. I am trying to move more into the mindset of quality over quantity, but I find it hard to resist pretty dresses... especially when they are under twenty pounds! But accessories are different. It doesn't matter if you change size or shape - shoes, handbags and sunglasses will always fit. 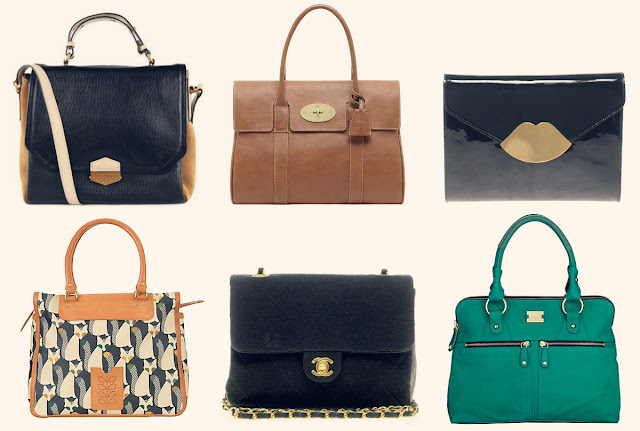 Generally I try and only blog about things that are affordable (maybe a little splurgey, but nothing too mental), but as it's "Linlithgow Chanel" day (omg), here's my pick of ridiculously beautiful handbags that are on my wishlist. A super chic leather cross-body bag. Such a grown up bag, it's lovely. & it's £470. The dream! Such a classic, wonderful, I-will-keep-you-forever bag. It's (gulp) £795. I am rubbish with clutches (I always drop them!) but I'd make an effort for this one! Love the lips clasp. It's £275. The foxes! Orla Kiely is a master of beautiful prints, and this is no exception. It's £255. OF COURSE I had to include Chanel. This one really is a dream, £1,600. A bright bag is a lovely way to add colour to an outfit. This one earns a million bonus points for having LOADS of compartments and pockets. & it's the cheapest on the list at £220. Disclaimer: This post is written on behalf of Dilemma. All dreamy bags chosen by me. Just amazing!!!!! These designs are specific and i am such a lot enamored withe these handbags. i do not know why but I'm having imagination of various cartoon characters in these bags and i am such a lot liking it. I'm always probing for new design bags, I'm so glad that I've found your post. Thanks for sharing.